Like the title says its called the 92.5 WXTU Toy Truck Parade. Its basically a Toy Run for kids thats done with all kinds of cool trucks. Im talking tractor trailers, tow trucks, dump trucks, lifted trucks, Minitrucks Etc. Any kind of cool truck you can think of is invited to this event. 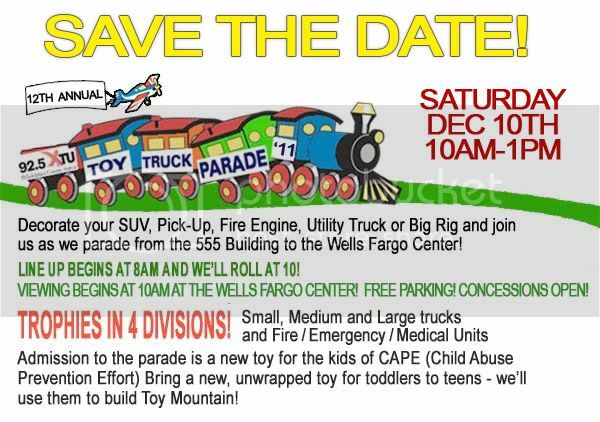 It is a free event all you have to do is donate One brand new toy and there is obviously no limit either. Its a fun event and its also a good cause. I did this last year with my work truck and my Mini on the back of it. They give out trophies to the ones best decorated in a Christmas theme too. You will meet at the XTU studio parking lot in Bala Cynwyd and we will parade down I76 to the Stadiums where it will end. From there you will bring the toys and be invited inside where they create "Toy Mountain". So like I said its a good time and for a great cause so it would be really cool to see some other Mini Trucks out there!